With the OnePlus 6 expected to be unveiled a week from today, the company announced an improved trade-in program to help prospective buyers save some cash. After all, the OnePlus 6 will probably be the company's most expensive phone yet; notches and IP certification ratings don't come cheaply, you know. With the new trade-in plan, devices from any manufacturer can be used in a trade, but higher values will be given to those products made by Apple, Samsung, Sony, Huawei and Google. Those turning in a OnePlus 3 or newer model will find a little extra money in their trade-in checks. OnePlus is offering as much as €280 ($332 USD) for old OnePlus models. This part of the revamped trade-in program expires at the end of this month. Before you start scrambling through your desk drawers looking for your old handset, there is a geographical catch; this trade-in program is only available to European residents using the Euro, the Swedish Krona, or the British Pound. To participate, click on the sourcelink or go to www.oneplus.com/trade-in. There, you will find the complete instructions (see the image at the top of this story). You can decide to receive a voucher by sending OnePlus information about your trade. Send them the old device and you'll receive a voucher within two weeks that can be used toward the purchase price of the OnePlus 6. Or, you can wait until the OnePlus 6 is launched and purchase the phone. In that case, OnePlus will give you cash in lieu of a voucher for your trade. Move your data from the old phone to the new OnePlus 6, go back to the www.oneplus.com/trade-in site, and use your order number to request a trade. Within two weeks after your trade is received by the company, you will receive cash for your old phone. For more information, visit the OnePlus trade-in site by clicking on the sourcelink. The site might have a bug. It shows 5T 128gb and 64gb same price while 128gb 5 offers more than the 5t version. I think the 332$ will be only for the 5T models. 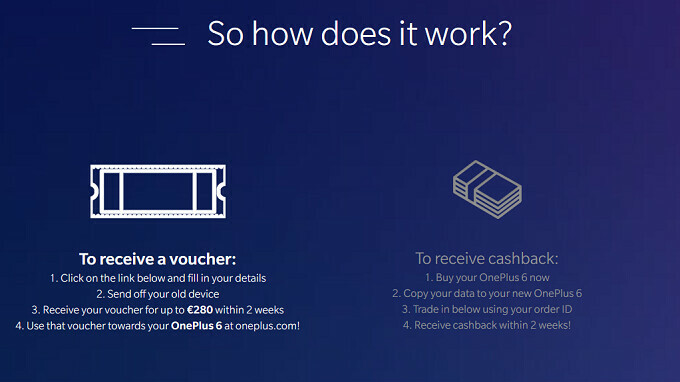 So, you are to trust Oppo's OnePlus, that within two weeks they will give you a voucher. Wanna bet THAT gets screwed up too? nothing for the OP2 owners? Terrific deal from One Plus, I must say. I am nearly 89% sure of getting the OP6. Just waiting on unveiling.